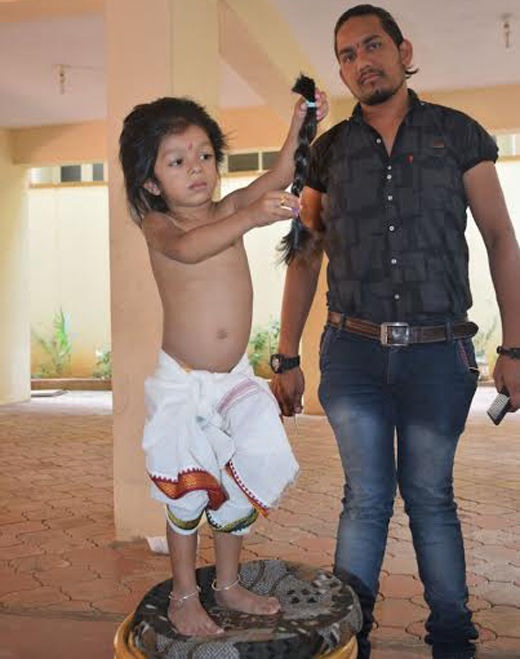 Mangaluru, Feb 18, 2017 : Two and a half year old Arnav from Mangaluru has joined hands in the task of wiping the tears of those who lose their hair during cancer treatment. 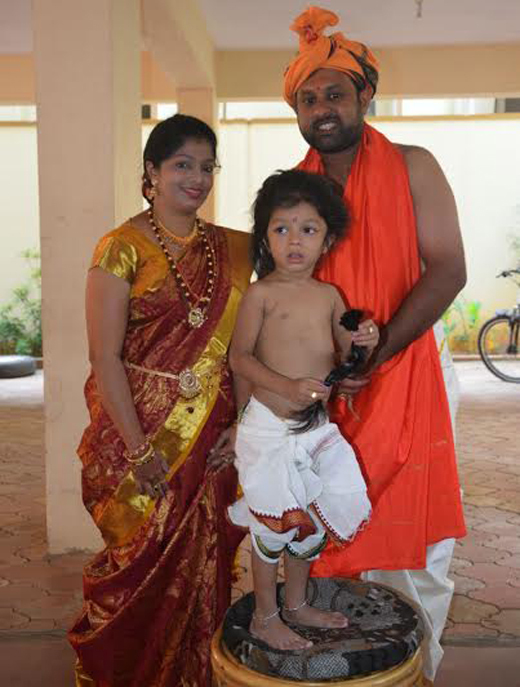 His Chaulopanayana, a ceremony of cutting the hair of a child for the first time as per tradition in the GSB community was conducted in a unique way by his parents Ashwin Prabhu and Shreelatha Prabhu, residents of Mannagudda. Instead of offering the scissored hair to the Homa Kunda as per tradition, the parents of Arnav have donated the hair to Pantene Beautiful Lengths which prepares wigs for cancer patients. As per the rules of the company the hair of a donor need to be of minimum 8 inch long, while Arnav’s hair measured nearly 10 inches. In case of Arnav’s Chaulopanayana only two strands of his hair were offered to the Home Kunda as per tradition while the rest was packed as per the company guidelines to be sent as donation. Before donation, the hair has to be shampooed. After blow dry, the cut hair is wrapped in a plastic and then sent to be sent to Pantene Beautiful Lengths Centre in America. Along with it the photograph of the child before hair cut and after hair cut has to be sent. The donors also have an option to suggest to donate the wigs to any nation and Arnav’s parents have requested Pantene Beautiful Lengths that the wig prepared out of his hair be donated to cancer patients in India. Pantene Beautiful Lengths has also confirmed that Arnav is the youngest to donate hair to them, informed Arnav’s parents.